By Tom-Business, Daily Life- No Comments. The top 50 cooperatives marketed 78.1 percent of the nation’s record-breaking 200.3 billion pounds of milk produced last year. 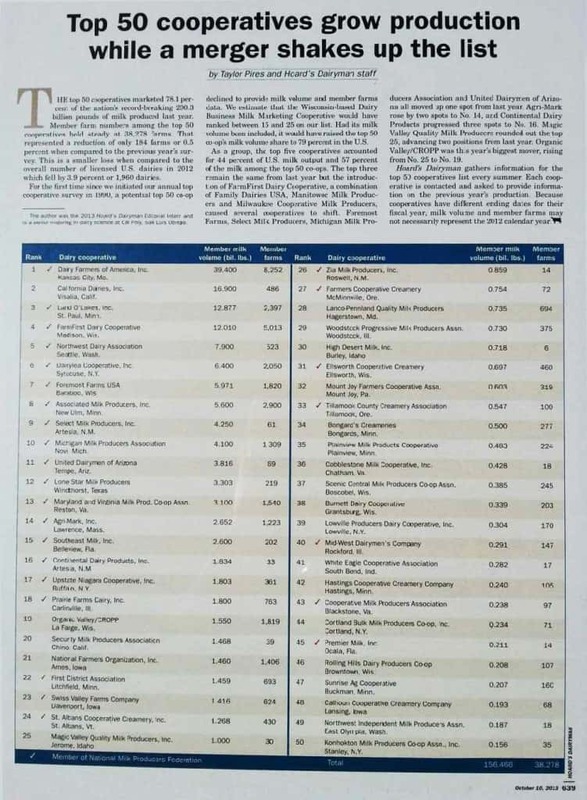 member farms among the top 50 cooperatives held steady at 38,278 farms. That represents a reduction of only 184 farms or 0.5 percent when compared to the previous year’s survey. This is a smaller loss when compared to the overall number of licensed U.S. dairies in 2012 which fell by 3.9 percent of 1,960 dairies. For the first time since we initiated our annual top cooperative survey in 1990, a potential top 50 top co-op declined to provide milk volume and member farms data. We estimate that Wisconsin-based Dairies Business Milk Marketing Cooperative would have ranked between 15 and 25 on our list. Had its milk volume been included, it would have raised the top 50 co-op’s milk volume share to 79 percent in the U.S.
As a group the top 5 cooperatives accounted for 44 percent of U.S. milk output and 57 percent of the milk among the top 50 co-ops. 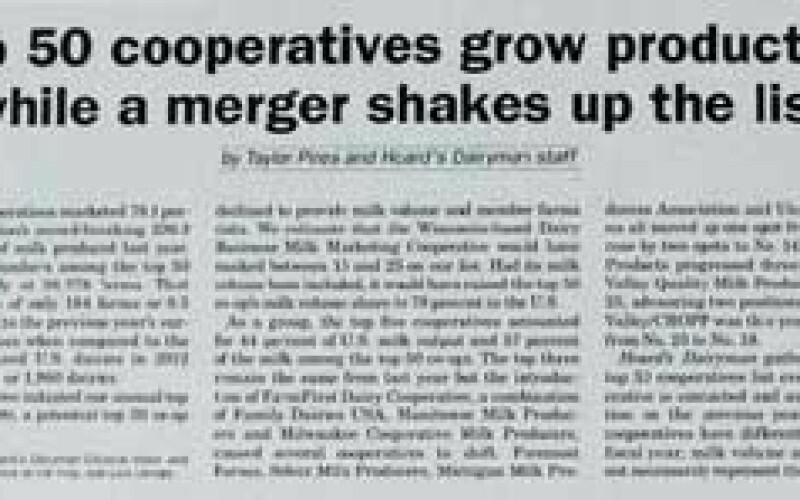 The top three remaining the same from last year but the introduction of the Family First Dairy Cooperative, a combination of Family Dairies USA, Manitowoc Milk Producers and Milwaukee Cooperative Milk Producers, caused several cooperatives to shift. Foremost Farms, Select Milk Producers, Michigan Milk Producers Association and United Dairymen of Arizona all moved up by one spot from last year. Agri-Mark rose by two spots to No. 14, Continental Dairy Products progressed three spots to No. 16, Magic Valley Quality Milk Producers rounded out the top 25, advancing two positions from last year. Organic Valley/CROPP was this year’s biggest mover, rising from No. 25 to No. 19. Hoard’s Dairyman gathers information for the top 50 cooperatives list every summer. Each cooperative is contacted and asked to provide information on the previous year’s production. Because cooperatives have different ending dates for their fiscal year, milk volume and member farms may not necessarily represent the 2012 calendar year.